The Fair Funding Now! 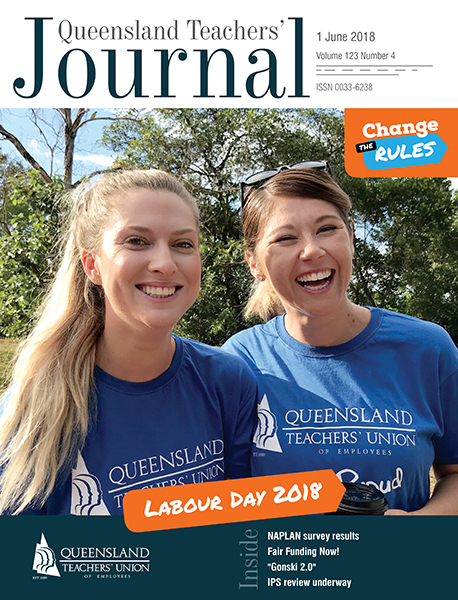 campaign was officially launched in Queensland on 19 May at QTU State Council. AEU Federal President Correna Haythorpe addressed Council about the need for our campaign to reach out to as many teachers, school leaders and parents as possible in the lead up to the next federal election. The campaign launch coincided with the commencement of a two-month bus advertising campaign on the north side of Brisbane. Members from across the state joined Correna outside the Brisbane Convention and Exhibition Centre at South Brisbane to officially launch the advertising campaign with one of the buses. The Queensland launch will be followed by several local launches in coming weeks: in Cairns, Emerald, Rockhampton, North Brisbane, South Brisbane and Logan. The Turnbull government has let state schools in Queensland down, with the most recent Budget confirming the $1.9 billion cut to public schools across 2018-2019 and capping the federal contribution to the schooling resource standard at 20 per cent for public schools, while guaranteeing 80 per cent for private schools. This model has baked-in inequality across the systems - by 2023, 87 per cent of public schools across the country will not be funded to the SRS, while 65 per cent of private schools will be funded in excess of the SRS in combined state and federal funding. immediately reverse its cuts to disability funding, and for the National School Resourcing Board to immediately review the three levels of funding for students with disability, to better align them with the actual costs of delivering a high-quality education. The QTU will be calling on members across the state to hold workplace meetings to discuss the Fair Funding Now! campaign and to encourage as many members as possible to sign up as official supporters of the campaign. You can sign up now at www.fairfundingnow.org.au to register your support. Our campaign will reach out to members, parents and the broader community, from the tip of Cape York all the way down to the Gold Coast, through targeted activities in key federal electorates. We know that by bringing together the combined strength of the teaching and parent communities we can bring about the changes we want to see and deliver fair funding for our schools.